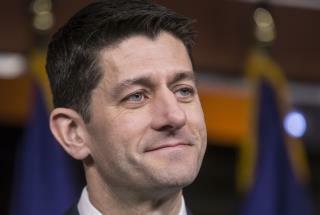 (Newser) – A month after saying he wasn't ready to do so, Paul Ryan endorsed Donald Trump Thursday via a guest column in the speaker's hometown newspaper, the Washington Post reports, noting that the move likely signals Ryan's desire to unite the GOP in order to ensure the House and the Senate stay in the Republican party's hands after the coming election. House Republicans have spent months putting together "a policy agenda that offers a better way forward" for the USA, Ryan explains in his Janesville Gazette column. That agenda involves "a better tax code," an ObamaCare replacement, national security and foreign policy changes, regulation reforms to give the economy a boost, proposals for decreasing poverty, and more, Ryan says. the sad truth is that dems and republ both work for the establishment. The real question is why we continue to argue with each other instead of teaming up and going after them. It's not that complicated. Democrats,(Hillarry), and Republicans(.,.,.,..) are both the same. Republicans and Independents wish the 2016 (I) Sen. BERNIE SANDERS will win and carry California state on our June 7 California Primary.